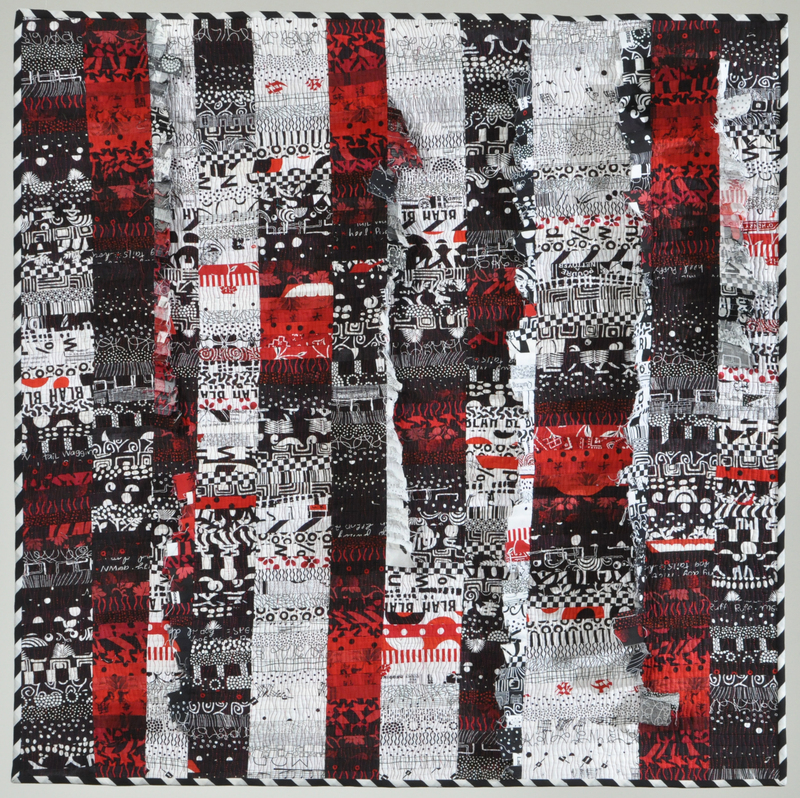 The Milwaukee Art Quilters | The Milwaukee Art Quilters (MArQ) make contemporary art quilts, pursue exhibit and competition opportunities, and support each other’s artistic growth. 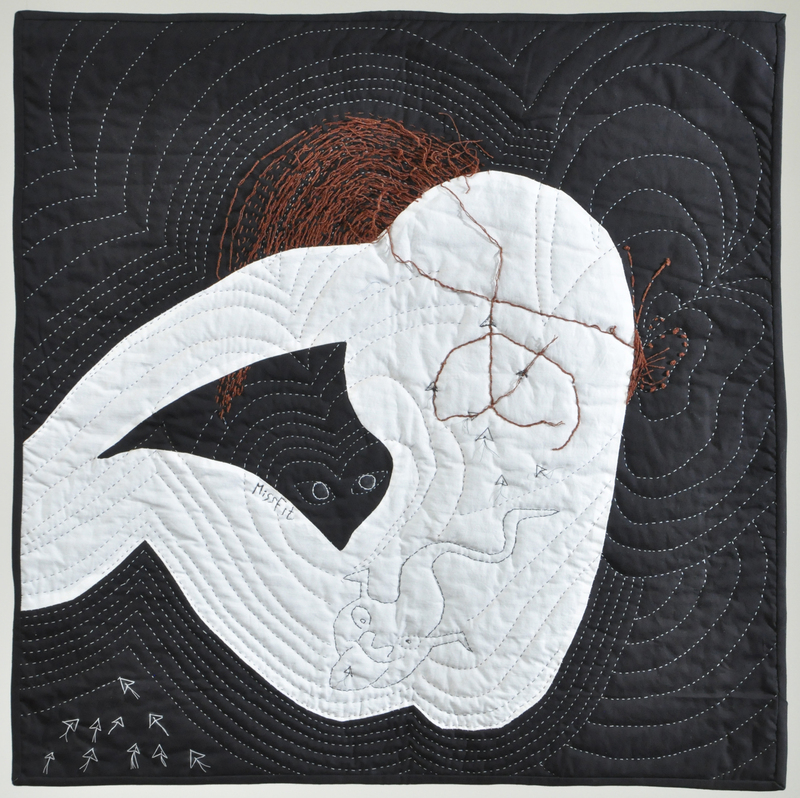 The Milwaukee Art Quilters (MArQ) make contemporary art quilts, pursue exhibit and competition opportunities, and support each other’s artistic growth. 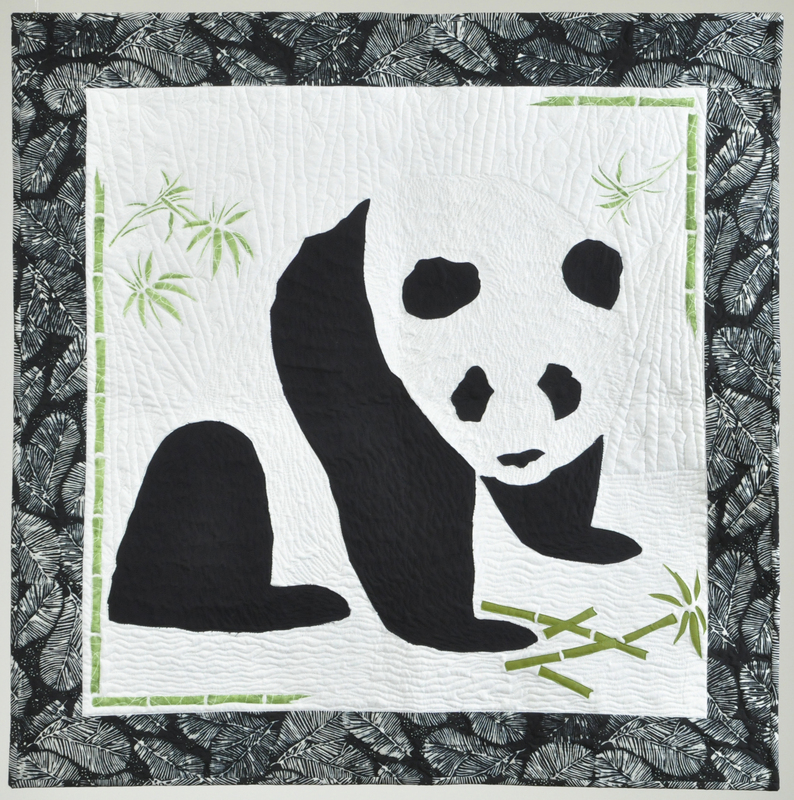 Create a quilt using any theme, but use text as a background element, not as the main design feature. Any technique. Size: 36 X 52” (+-1”), vertical format. 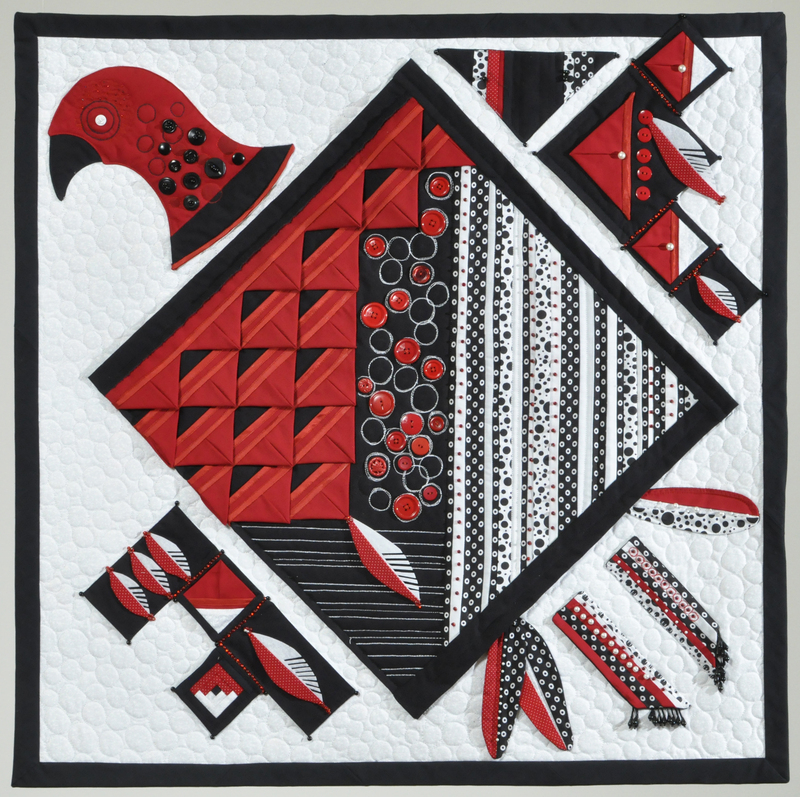 Quilts due at the MarQ March 2018 meeting. 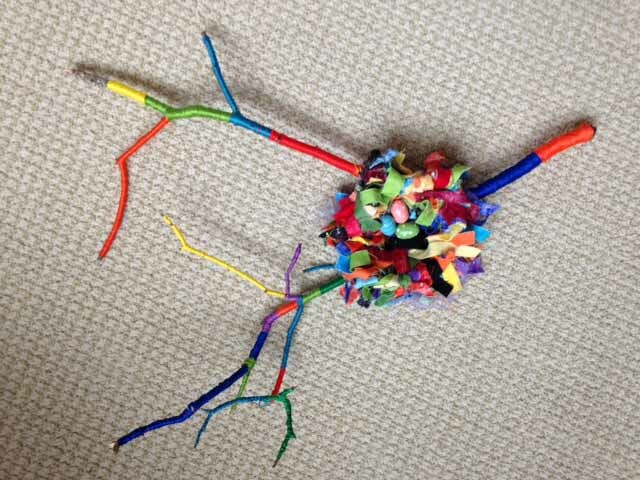 Categories: MArQ Themed Exhibits, Supporting Words | Tags: MarQ Themed Exhibits | Permalink. Categories: MArQ Themed Exhibits, Not So Mellow Yellow | Tags: MarQ Themed Exhibits | Permalink. 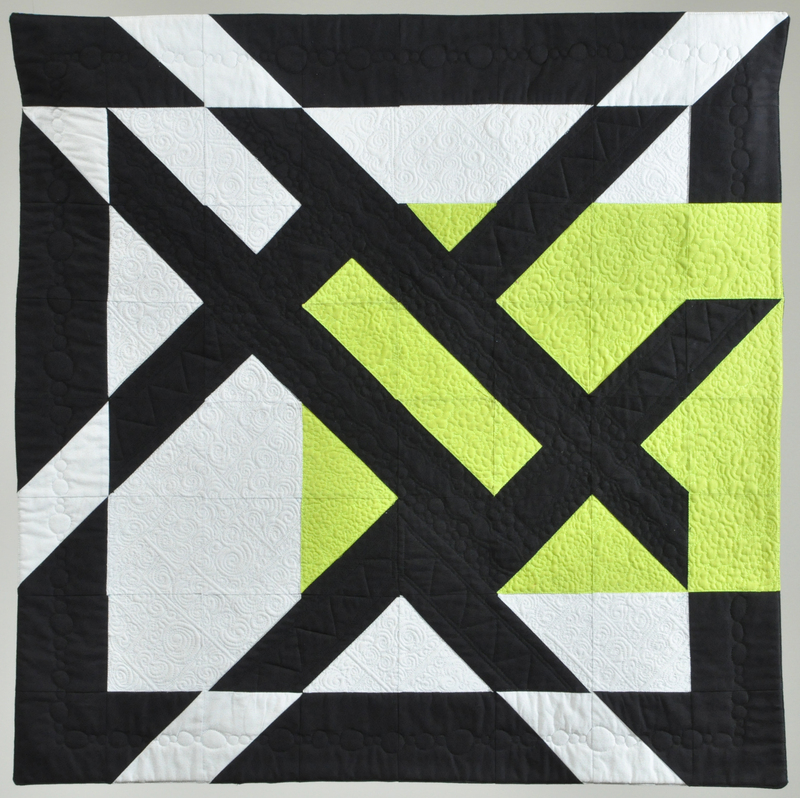 Create a quilt using design elements of Art Deco. Categories: MArQ Themed Exhibits, Objet D’Arc | Tags: MarQ Themed Exhibits | Permalink. This year’s small challenge was Shape Exploration: Choose one basic geometric shape and explore it. 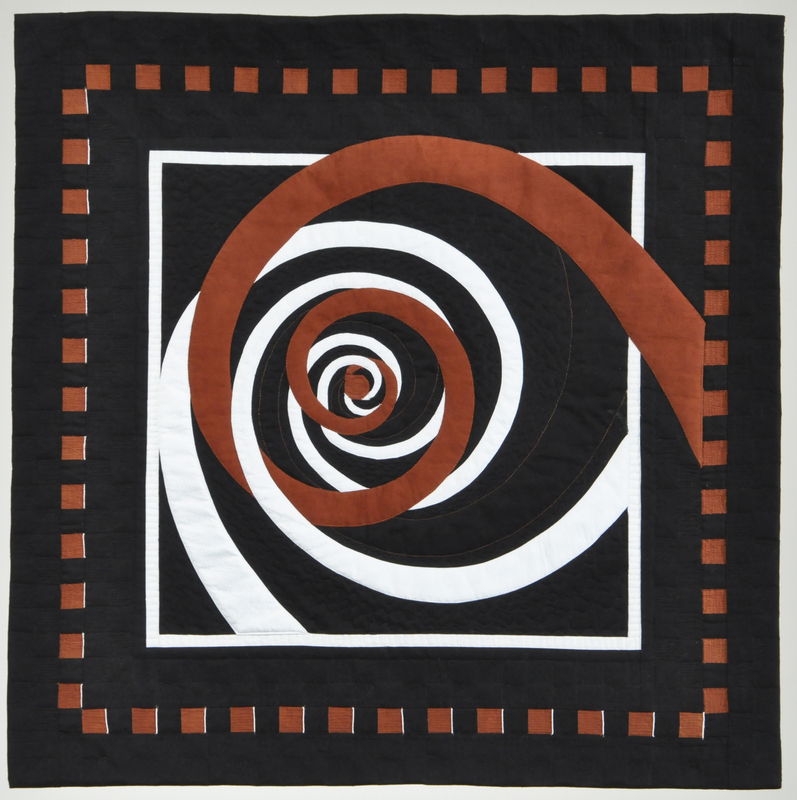 The shape of the quilt was up to the maker. Maximum size 31″ in any direction. Categories: MArQ Themed Exhibits, Shape Exploration | Tags: MarQ Themed Exhibits | Permalink. 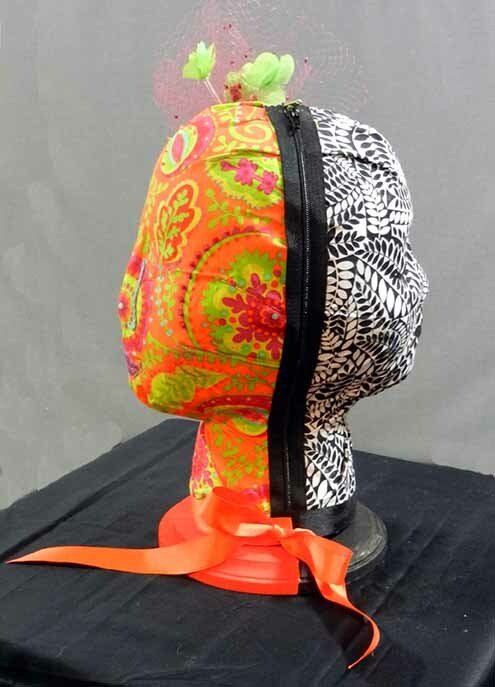 Use only black and white fabrics plus one other single color. This is meant to be visually high impact. 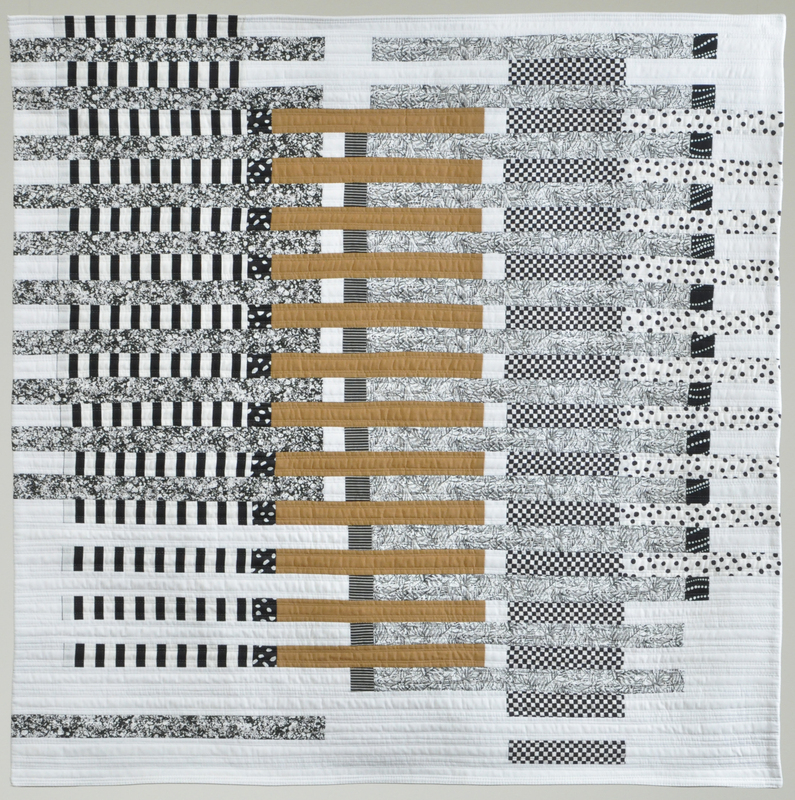 You can use as few or as many fabrics as you want, prints and tones on tones are okay as long as they READ black, white and the single chosen plus color in hue, tone and value. Your black should not drift into gray or your white drift into cream/beige unless you want gray or beige to stand as your third color. Black & white should be the highest ratio; any amount of color up to but NOT more than one third of the total surface. 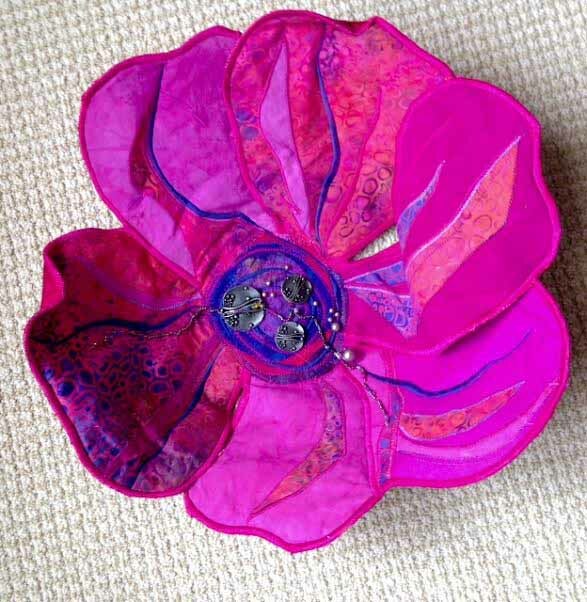 Style, subject matter and technique is the choice of the artist. 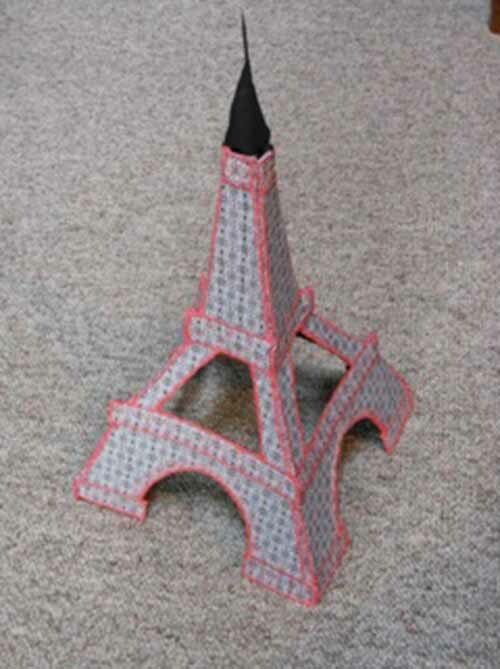 Size is 32″ square (+/- 1 “). Categories: Black & White + 1, MArQ Themed Exhibits | Tags: MarQ Themed Exhibits | Permalink. 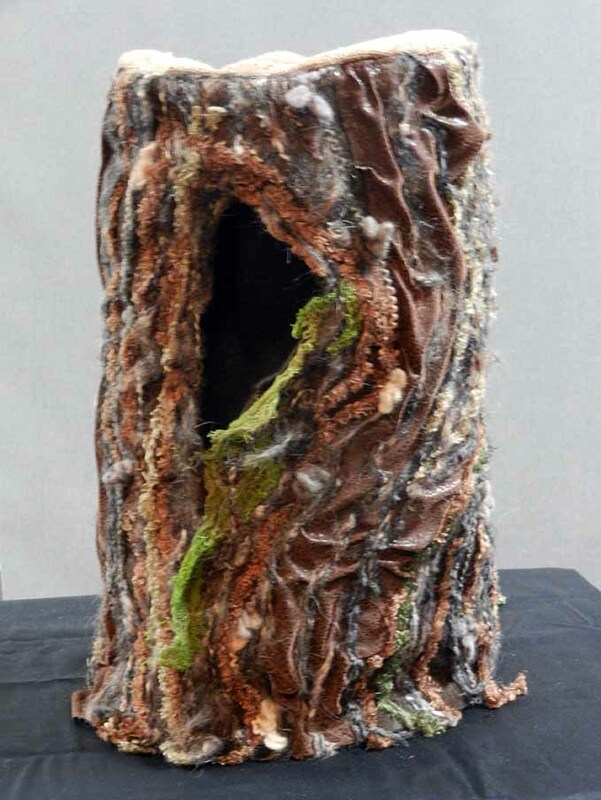 Construct a 3 dimensional “abode”. The only size restriction is that it must be able to fit on an 18″ diameter pedestal. 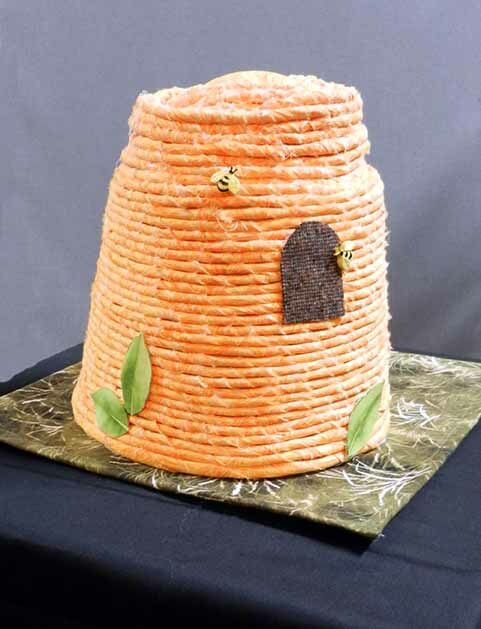 Any type of abode, any fiber technique. Categories: 3-D Abodes, MArQ Themed Exhibits | Tags: MarQ Themed Exhibits | Permalink. 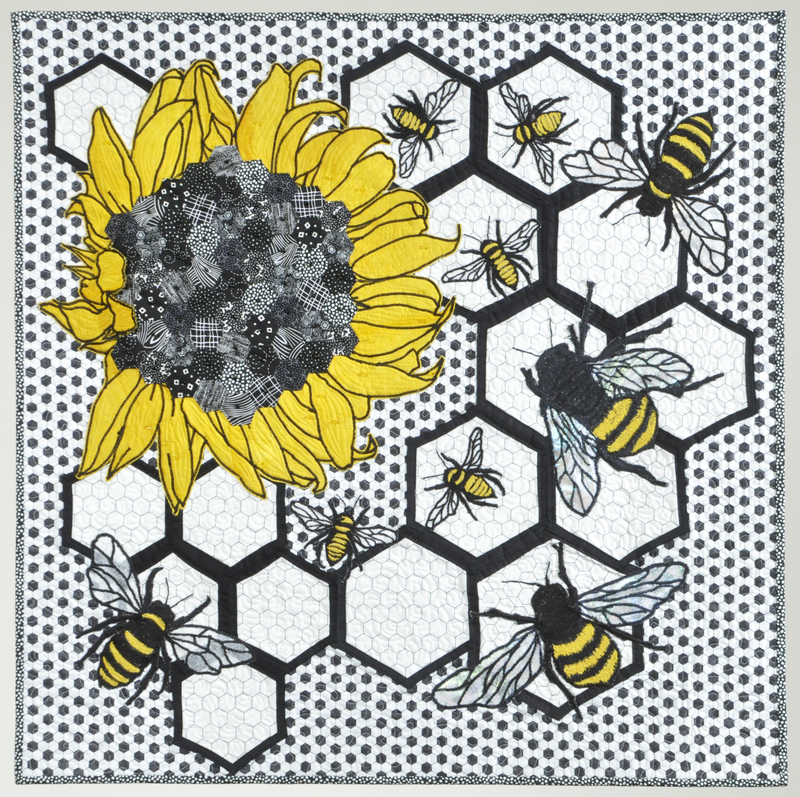 Techniques: Piecing, applique (hand, machine, reverse, raw-edged, replique), fusing, painting, inking, machine quilting, machine and hand embroidery, machine free-motion embroidery, bleach discharge, use of markers. 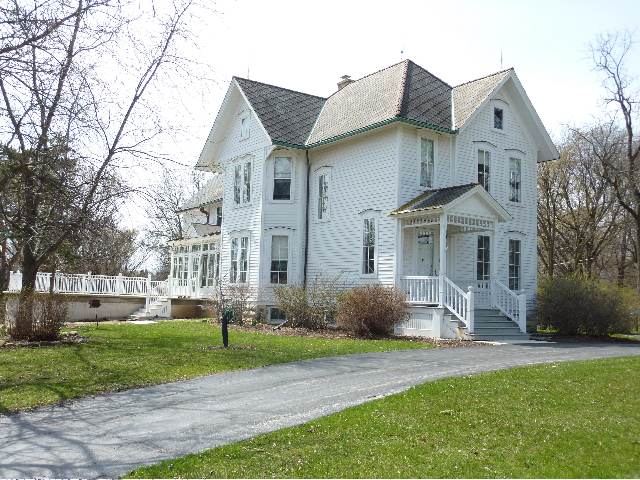 The Jennings homestead at 12237 Watertown Plank Road in Wauwatosa, Wisconsin, started life as the farm house of the Edward Robbins family in 1884. This farm extended from Watertown Plank Road on the north to 124th Street on the west to Underwood Creek on the south and to an unknown (to us) boundary on the east. The house was sited on the highest part of the 70 plus acres. Clad in wood clapboards with a wood shingle roof later covered in the early 1900s by an asbestos cement roof and topped by several lightning rods, the farmstead had nearby a three-story shed which once held horses and buggies, a well-equipped shop, chicken and pig quarters, and a storage attic. Other artifacts found on the property included a grindstone, a huge driveshaft, an under-basement cistern, a well, and the foundation of an additional outbuilding, possibly a milk house. By 1987, when Paul and Teresa Jennings purchased the house and 2 acres, the place was in considerable disrepair. The grounds were tangles of trees and overgrown shrubs all tied together with grape vines run amok. Stinky trees of heaven shoved against the east side of the house. However, on the west side, 2 beautiful elm trees over 100 years old provided blessed shade. The house had 2 porches, both sagging and rotting. The original clapboards were hidden beneath asphalt shingles. Inside, the Robbins’ heirs had created 2 apartments, one on each floor. Decorative Victorian ceilings had either been dropped or covered with ceiling tile. Floors were overlain with modern materials. Plastic tile, circa 1952, adorned the kitchen. In the basement, a boiler that looked like an octopus overpowered the space. The Jennings began a program of restoration, first reconverting the house to a single family dwelling. As funds became available, the asphalt shingles were removed, revealing mostly intact clapboards and a surprise: the footprints of eyebrows over the windows. Carpenters replaced broken clapboards and restored the eyebrow feature. 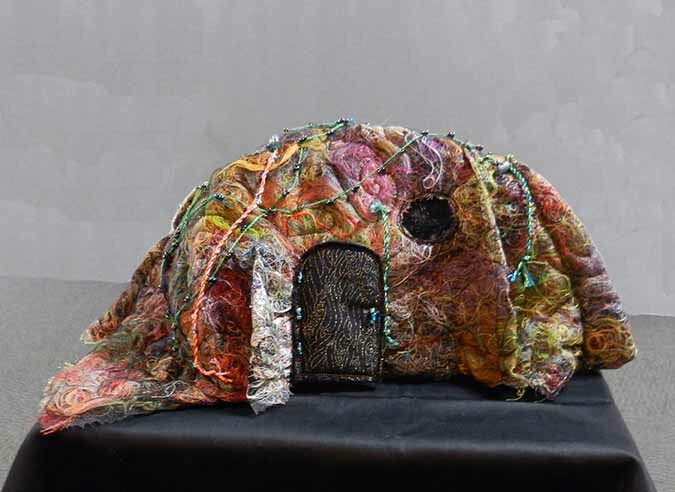 Next came insulating the walls, painting the exterior, adding air conditioning, and replacing the octopus, which had been sheathed in asbestos, necessitating a Hazmat treatment. The front porch was restored. The side porch was torn down and replaced with a 4-season room. An elevator and a small indoor pool were added to accommodate Paul’s health issues. Both Jennings each had an office on the first floor. Two recent projects were the front foyer, restored to sparkling Victoriana, and a master bathroom in the Craftsman style. The remaining rooms are works in progress. In 1990, the Jennings began Plank Road Publishing in their dining room, living room, and offices. Their main product was Music K-8, a music magazine for school children. After 3 years of employees taking over their first floor, the Jennings rented a small building next to Underwood Creek in nearby Elm Grove. In August 1998, the creek had a flash flood, inundating their offices, ruining computers, desks, and inventory. The company returned to the Jennings house while looking for a new rental space that was suitable. And dry. In the fall of 1998 they moved to the current space on 126th Street in Brookfield, leaving the 1884 house once again the residential domain of the Jennings. 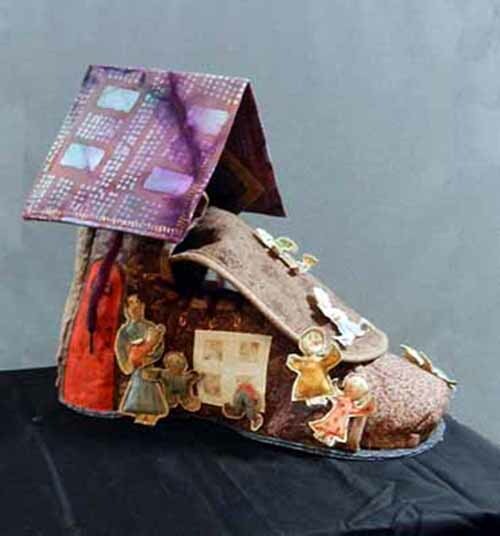 By 2001, the Milwaukee Art Quilters membership was enlarging to the point that meeting in each others’ homes was no longer feasible. As they searched for larger meeting spaces, it became apparent that the area around 124th Street, the dividing line between Milwaukee and Waukesha counties, was the geographic center of the far flung homes of the members. Suzanne Riggio asked her daughter, Teresa Jennings, if the group could meet in the conference room at Plank Road Publishing. Yes, the group could. 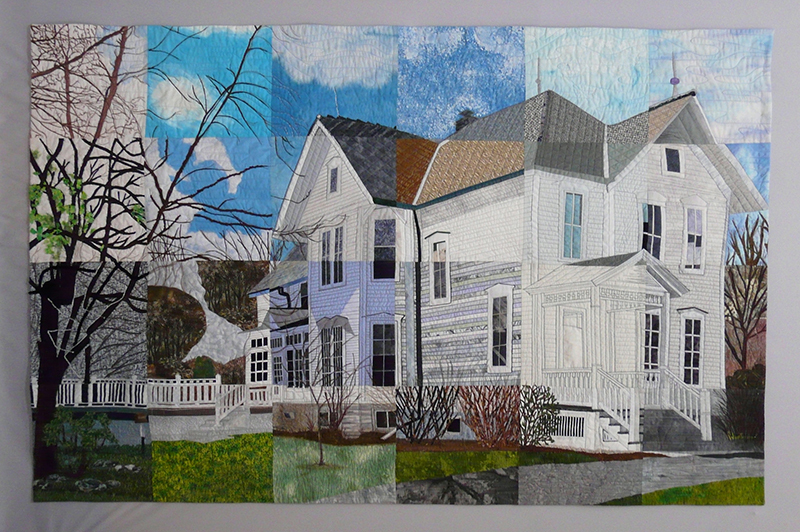 In gratitude for the generosity of the Jennings for the past 10 years, the Milwaukee Art Quilters decided to make them a “slice quilt” of their home. 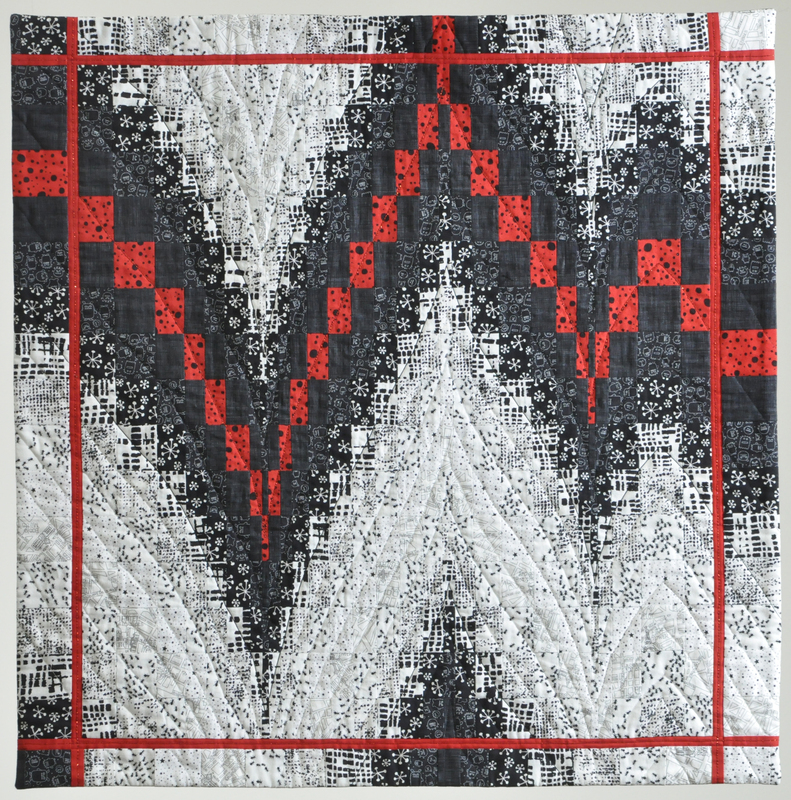 Judy Zoelzer Levine was the only member of the Milwaukee Art Quilters (MArQ) who had had experience with making a slice quilt and was a natural to ask to take charge of this project. 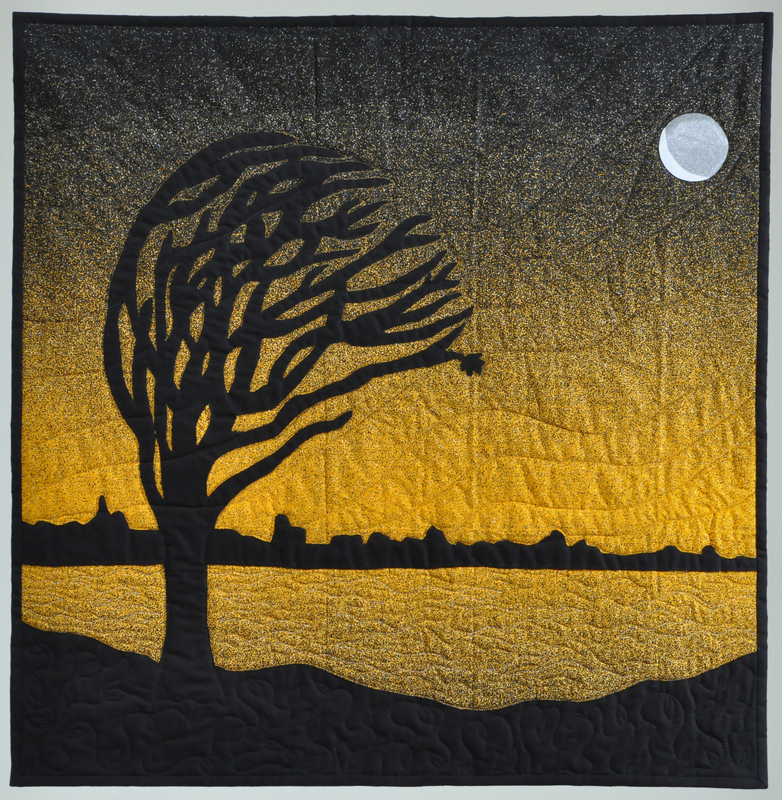 A slice quilt is an image, considerably enlarged, that is then cut up into slices. Individuals execute a single slice. Slices are then sewn together. 1. The black outline is the seam line. Please extend your design beyond the black line and leave a generous 1/2” seam allowance to allow us to make alignment adjustments if needed. 2. The large block is in gray scale with exaggerated lines. Please use the color photo as your color guide. 3. Any technique may be used. 4. If you want to add some color to the landscape, it was decided the season should be “Winter into Spring”. 5. Blocks are due in June . Many people worked behind the scenes on parts other than the blocks themselves. Below are these names. Finally, there is the chart of slices showing who did which block. Third row: Laura Krasinski, Mary Ellen Heus, Judy Zoelzer Levine, Linda Benson, Marianne Kayne, Jane Misslich, Kathleen Sweeney, Kathie Boucher, and Roberta Willliams. 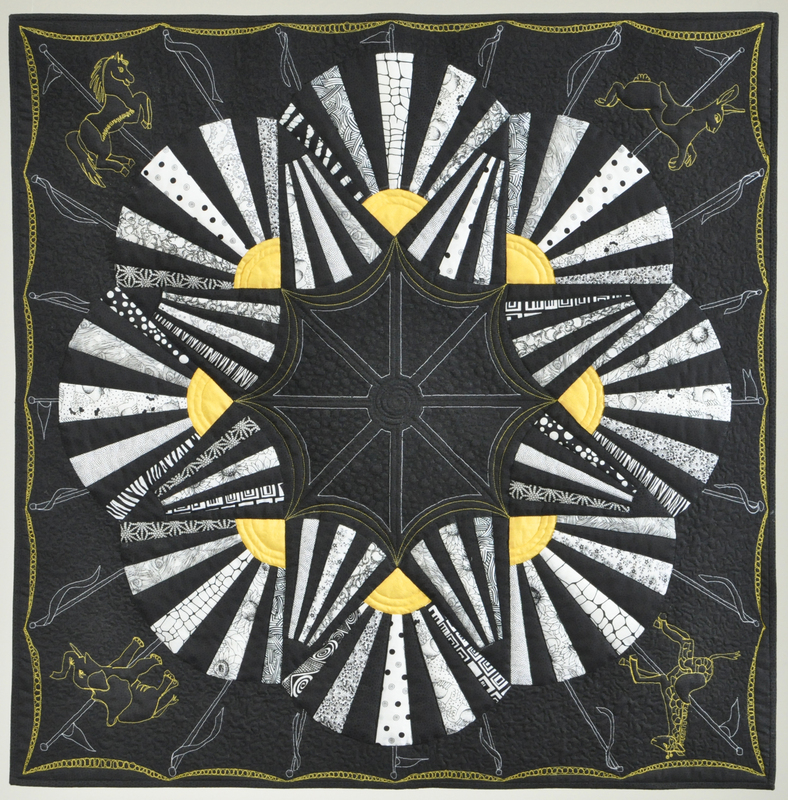 The Milwaukee Art Quilters (MArQ) is an unusual guild with no officers and no dues. The work gets done by volunteers from among the 51 listed members. Meeting monthly in Wauwatosa, a western Milwaukee suburb, its members drive up to 80 miles roundtrip to meet, with one member making the trek from Illinois, even farther. I first heard of the group when I moved to the area from West Virginia in 1995. 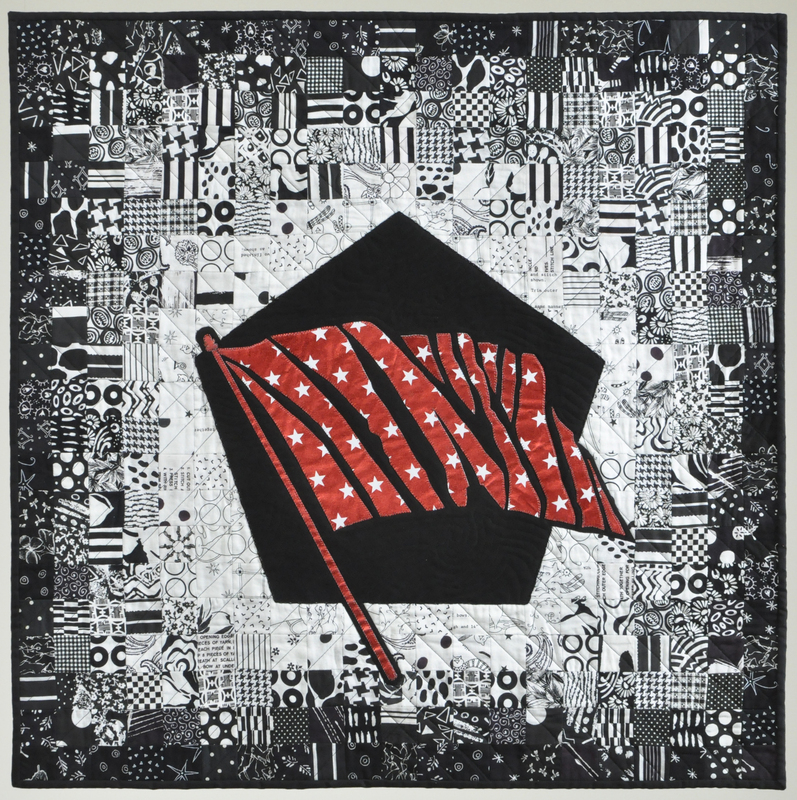 My friend Caryl Fallert in Chicago recommended the Milwaukee Art Quilters founded by Necia Wallace, who had gathered a small group of artists from the North Shore Quilt Guild in 1992. The seven or eight members met in each other’s homes all over the Milwaukee area. Word got out; membership grew. By 2001, with about 25 members, we had trouble fitting in anyone’s house. My daughter, Teresa Jennings, ran a business, Plank Road Publishing, which had a large meeting room. I asked if we could meet there; she graciously agreed. And MArQ had a new home. Our meetings usually run this way: a short business meeting that includes introductions, old business and new business; and the main event, show-and-tell. We take turns, alphabetically, in leading the meetings. We share ideas and techniques, tell stories of successes and near-disasters, ask for critiques, and take part in at least two challenges per year. We have become good at finding venues to exhibit both the results of our challenges and other work. And more and more artists have joined us. In 2010 we thought ahead to 2011, when we would have been meeting at Teresa’s company for 10 years. We decided it was time to thank her and her husband Paul for their generosity. Teresa and Paul had not only been growing their company, which specialized in music for elementary students, but they had been busy restoring their home, an 1884 Victorian farmhouse. 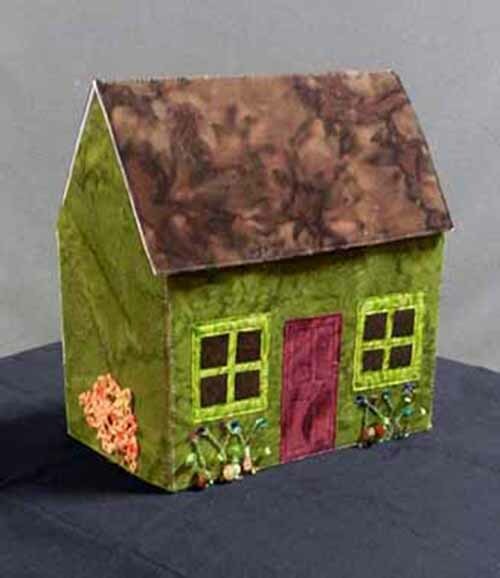 A collective light bulb went off–how about a slice quilt of their pride and joy, the old Victorian? 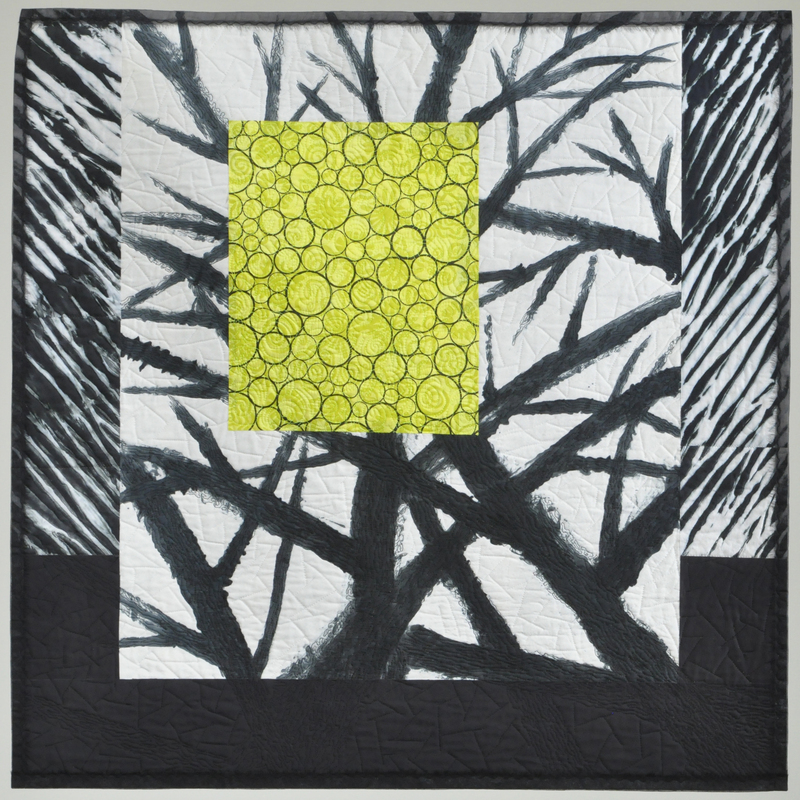 The only person in MArQ who had made a slice quilt before was Judy Zoelzer Levine. She agreed to be our designer/orchestrator. We had to consult with Teresa because we needed her help with the photographic view she would prefer. Since she did not want trees and shrubbery to obscure her 1884 gem, she provided us with a late winter picture, complete with a Wisconsin gray sky. Judy photo-shopped a blue sky with fluffy white clouds to set off the house more attractively. She then sliced the image into 24 blocks and turned each photographic image into a cartoon to clarify and simplify the elements. 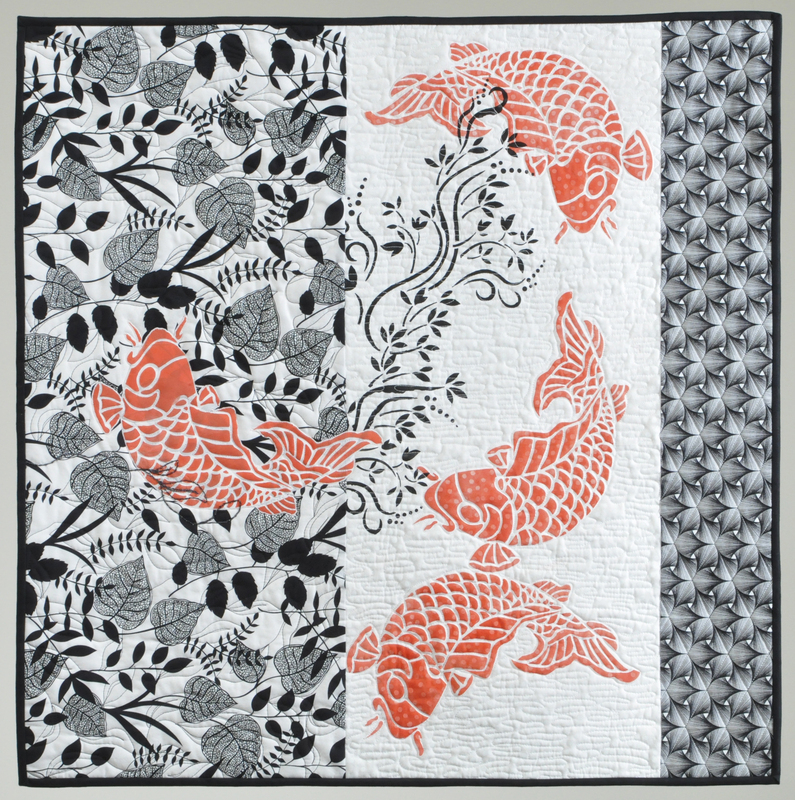 With the help of Kathleen Hughes and her wide bed printer, she was able to fashion a full-sized, gray-scaled cartoon paper pattern of each block. A heavy black line around each block would be the seam line. 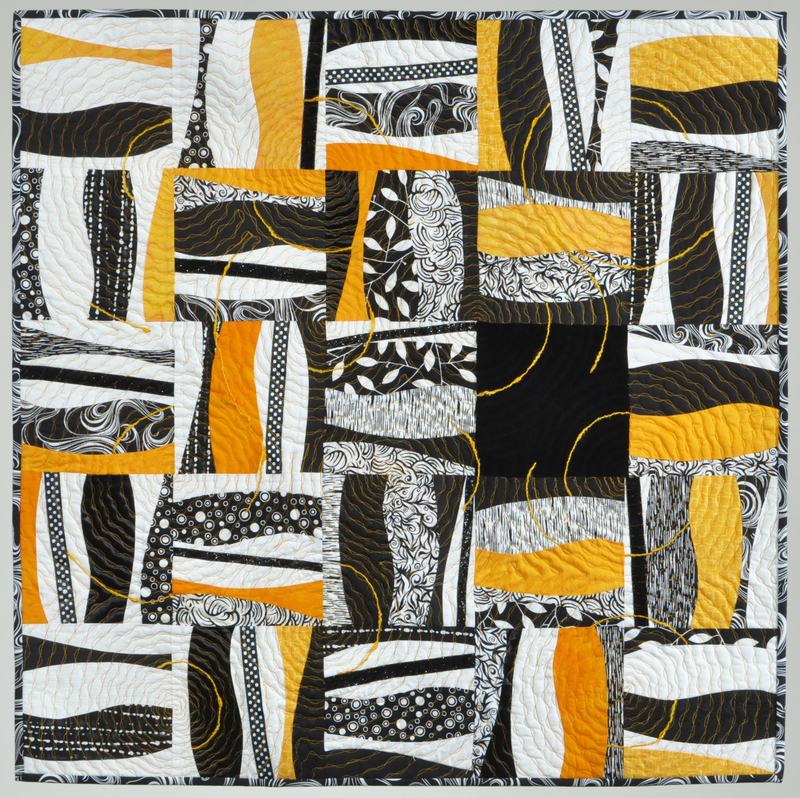 Judy asked artists to continue the design beyond the black line and to allow a one-half inch seam allowance to facilitate alignment adjustments. As Judy and Kathleen have recalled these wide-bed sessions, both of them say there was considerable laughter seasoned with untoward remarks aimed at the balky machine. Each block maker received the full-sized, location coded, paper block pattern, a gray-scale location map, and a large color photo of the house with block locations. Any technique would be allowed. And how! We ended up with raw batting as clouds, hand and machine embroidery, meticulous piecing, use of markers, appliqué, fusing, discharging, 3-D leaves, and painting. We soon had 23 volunteers who enthusiastically attacked their individual blocks. But block number 24 was unclaimed. Judy finally declared that the quilt would go forward with a hole in it. Someone stepped up, thank goodness. What a great day it was when Judy brought in the quilt top, 69.5 inches wide by 45 inches high, all pieced and aligned so beautifully. 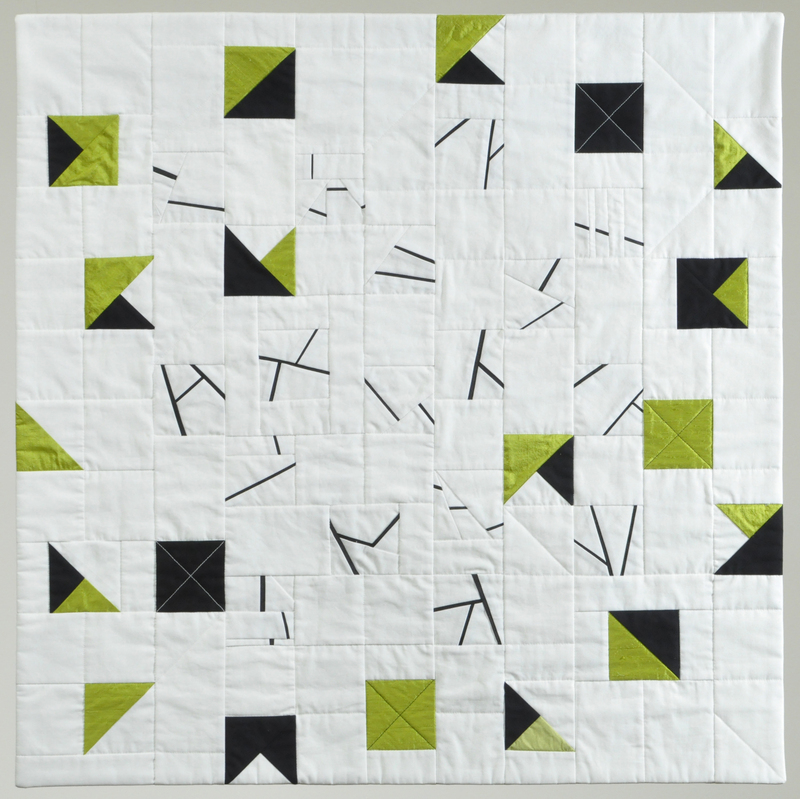 Now it was the turn of Terri Kirchner and her long arm, quilting machine. Terri was masterful—following each clapboard, architectural detail, and tree branch, making the connections between blocks quite cohesive. I had volunteered to do the finishing–facing, sleeve, and label. However, I suffered a shattered femur, which precluded any machine work for about six months. Deb Kinder and Linda Benson stepped in to help, doing the sleeve and facing. I was finally able to do an extensive label with “before” and “after” pictures of the house, its history, and the history of the quilt, along with acknowledgements of who did what. We held a small ceremony to present the quilt to Teresa and Paul Jennings. It was rather emotional but so rewarding to be able to thank these two benefactors. 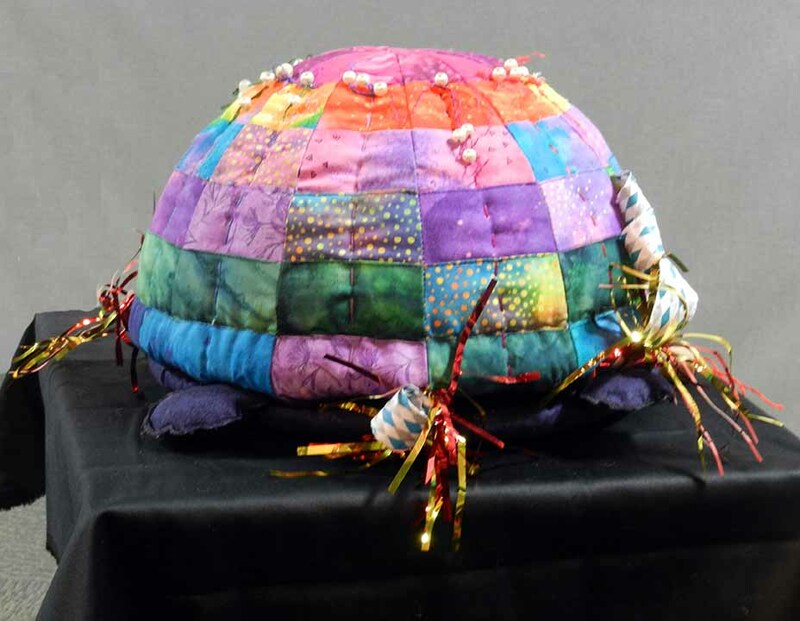 Since I knew Teresa would not be hanging the quilt just yet as she continued to do more restoration, I volunteered to send the quilt to shows, hoping to win enough prize money to cover the entry fees and shipping costs. So far so good. It has won prizes at each of the shows it has been in. To wit: Honorable Mention at the MidAlantic Quilt Festival in Hampton, VA; First Place and Viewers’ Choice at the Crazy Quilters Show in Mukwonago, WI; First Place, Viewers’ Choice, and Judge’s Choice at the It’s A Stitch Show in Jackson, WI; Best of Show and First Place at the West Virginia Quilt Festival in Summersville, WV; Second Place at Quilt Odyssey in Hershey, PA; Honorable Mention at the International Quilt Association Show in Houston, TX; and Best Group Quilt in Road to California in Ontario, CA. Members of MArQ who worked on The Jennings Homestead were Judy Zoelzer Levine, Terri Kirchner, Suzanne Mouton Riggio, Kathleen Hughes, Deb Kinder, Chiyoko Bermant, Jane Misslich, Beth Shulman, Laura Krasinski, Sonja Pavlik, Jane Walton, Chris Kirsch, Cecilia Rotter, Nancy Kimpel (deceased), Toni Mitt, Kasia, Casey Puetz, Linda Benson, Marla Kennedy, Sandy Hendricks, Kathie Boucher, Chris Sommerfelt, Marianne Kayne, Kathleen Sweeney, Nancy Linz, Roberta Williams, and Mary Ellen Heus. Categories: MArQ Themed Exhibits | Permalink.